On March 19th, 2012, I wrote my very first post for this site, First Foray (though, I’m not linking it here because it’s terrible). Now, over five years later, I have written my 300th post. Nearly every Wednesday (or hungover Thursday) I wrote something for this site, but what that something is has changed over the years. Matured. Sharpened. Doubled in length (sorry). Silence – This was the third post I ever wrote, still an undergrad in my senior year. The first posts on this site started off mostly with my musings on life, from the everyday to the grandiose. The language was flowery, the topics often whimsical, and the entertainment…well, my mom liked them. This post was all about my love for silence, a stance I’m maybe less extreme about today. How the CIA Predicts the Future – About the time I started graduate school, the blog took on a much more focused direction; that is, science. Particularly, I started writing more posts that had some kind of psychological theory or phenomenon explicitly associated with it. Oh, and I started using references and citations. And pictures. This post was (and still is) one of my favorites; the title says it all. Solving the Voting Crisis. Kind of. – Becoming more invested in psychology in my own life, my posts began to reflect that, often featuring detailed descriptions of how studies were run and/or citing multiple articles in a single post. This era of Jake was heavy on the psychophilosophy and not as much on the everyday. This post, however, did a good job of blending both—and highlighted the power of a simple psychological phenomena that can have impactful, real world differences. The Scarlet T – Finally, we get to the modern era of everydaypsych.com posts. These posts often feature segmented articles, multiple pictures, a “Psychophilosophy to Ponder” section, a featured image, fireworks, magnificent fragrances, and a whole lot of fun. Or at least learning, which, if you ask me, is fun. (“Well you shouldn’t have asked me if you wanted a different answer”). This post was one of my most popular, shared on facebook over 120 times—which isn’t terrible considering this website’s humble beginnings. In this post, I talk about the stigma associated with mental illness and why and how we can work to overcome it. So there you have it! 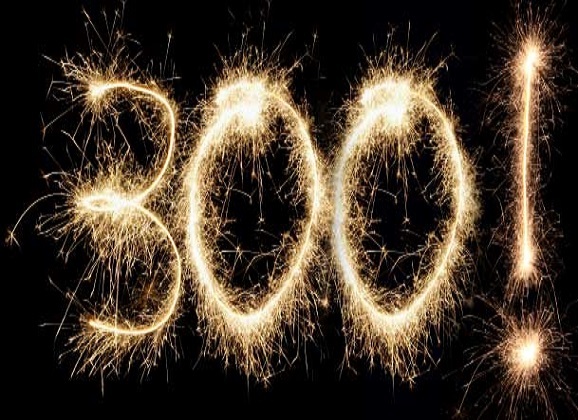 Happy 300th to me, and happy 300th to the only other person who’s probably read all 300 posts, serving not only as my biggest fan but also this website’s webmaster: my mom, Rochelle Teeny. Cheers to Ro! Haha One day, I’ll come up with something to market… 😉 And you loyal fans will get a gift of some kind for your continued support.